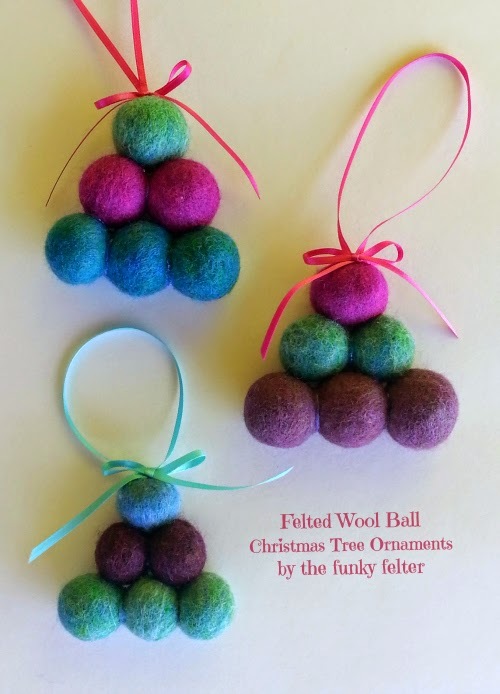 Make your own felt wool bead Christmas ornaments! This simple craft uses felt wool balls, hot glue and ribbon. After many years of needle felting and wet felting, I have an abundance of felted wool beads stashed away in plastic shoe boxes. They are all sizes, shapes and colors. This year, I dug through my stash to make some very simple Christmas tree ornaments. Maybe you have your own wool bead stash. If not, craft stores are beginning to carry them and you can find them online. Or, substitute large pom poms instead. This can also be a good kids felt craft with supervision if using a hot glue gun, or substitute a thick tacky glue instead. Improvising is allowed! Just make some quirky Christmas tree ornaments! See below for the easy tutorial. This is very quick and easy. First hot glue a row of three felted beads. Then hot glue a row of two beads stacked on top. Finally place the last bead on top and hot glue in place between the previous two beads. Now cut about a 6 inch length of ribbon, knot the end and hot glue on top for the hanger. Then cut a slightly longer piece of ribbon for the bow, tie it and hot glue to the base of the hanging loop. Ta-da! Your little felt tree is done. Now make another one or two :) Happy crafting!